Over the past 15 years, 6,600 Americans have been killed due to the wars and countless others have experienced major limb amputations and traumatic brain injuries. These wounds take years of therapy to deal with and require the support of families, medical experts and the entire community. While these circumstances and statistics sounds bleak, there are individual stories of heroism and determination that provide hope even as these wars continue to wage on. One such story is that of U.S. Army Captain Luis Avila, who joined the army in 2000, right before the September 11th terrorist attacks. In December 2011, Avila was on his 5th deployment and leading the 720 MP battalion back to base after a successful mission in Afghanistan when a 600-pound IED exploded directly beneath his vehicle. In that moment, his first thought was of his fellow soldiers. He called out to his battalion to check on them before losing consciousness. It would be 40 days before he woke from a coma to a whole different reality full of new challenges. Immediately after the attack, which killed two others, he experienced two strokes, two heart attacks and had to have his leg amputated. Even after he regained consciousness, he was unable to see, speak or eat. The simple act of lifting his head was too much at first, but with his devoted wife, Claudia, and his family by his side, along with intensive physical therapy, occupational therapy, speech therapy and music therapy, Avila has been able to make great strides in recovery. In 2015, the family decided to apply for housing through the Gary Sinise Rise Foundation, which provides a variety of different support services to help veterans, first responders and their families. Through the program, Avila and his family were able to move into a fully accessible home near the Walter Reed Army Medical Center, where Avila continues to receive care and rehabilitation. The home has provided both Luis and his family with a new sense of freedom and independence and done wonder for his morale and recovery. We are also proud to say that Luis is one of many inspirational ATC owners. 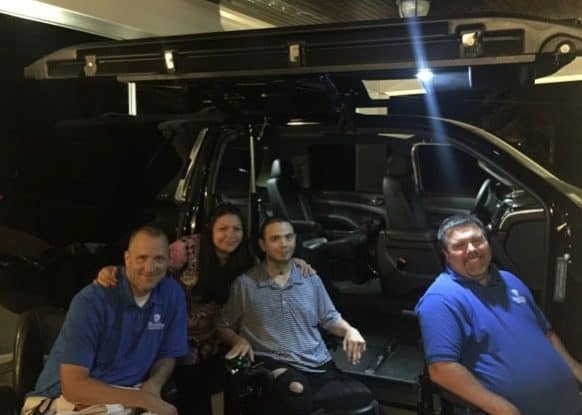 Faces of Valor, another organization that raises money to support veterans and their families, helped the Avila family receive a 2017 Suburban from ATC. This vehicle has been designed to provide maximum accessibility so that Luis can easily load both himself and his power wheelchair in just a matter of seconds. The entire Avila family is able to travel with ease and even more freedom and convenience. Luis and his family are truly an inspiration and a testament to the power of determination. They are also a perfect example of why we are passionate about providing the highest quality wheelchair accessible trucks and SUVs. We are proud to be able to be a part of community wide efforts to support veterans and others will mobility challenges so that they can enjoy more freedom and a better quality of life. 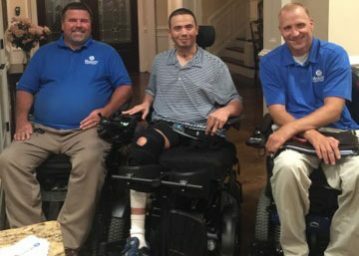 Claudia and Captain Avila (center) with Ryan Green (left) and Jason Blackwell (right) from Mobility Supercenter, an ATC Dealer. Avila (center) with Jason Blackwell (left) and Ryan Green (right) from Mobility Supercenter.